No, it wasn't more stash! :) My grandma made a quilt for the baby! She's made quilts for both my boys, but it was still a surprise to get in the mail yesterday. I love the border on it! Sorry it's not the greatest pic... feeling lazy today! :) Write more later! How wonderful that your grandma made you that sweet quilt. You are doing great on VoHRH--I love seeing your pics. That quilt is fabulous! Your little one is very lucky!! Your quilt is so beautiful and you are so lucky to have a sweet grandma to make something so lovely for you and your baby!! I am so enjoying watching your continued progress oh Village of Hawk Run Hollow! You have gotten so much done and it is just beautiful. I wish I could afford to get it for me, but watching others is so inspirational. You really do beautiful work! that is so wonderful, she did red work (or ehem, blue work). One of my FAVORITE forms of embroidery on quilts!! What a wondeful surprise and heirloom she made for you and baby! You and my DIL are running a close finish on delivery..
What a beautiful quilt from your grandma - lucky you and lucky baby too! The quilt is beautiful! Lucky baby! The quilt is beautiful! Your grandmother is very talented. The village is looking great so far. You are a fast stitcher! I have this and HOHRH in the someday I will stitch pile. What a gorgeous quilt!! I took some quilt classes, but I have not time to do it! You are making great progress on VoHRH! I am only on the top of square #1 still! Oh wow! What an absolutely beautiful quilt! Are those squares stitched too or is the fabric printed? It's really lovely. How specail. And VoHRH looks great. I may have to put it on my wishlist after all - the more I see of your progress the more I like it! I love the quilt - what a nice present for you and baby! I am just amazed at your VOHRH progress! I feel like quitting my job so I can stitch as much as you do - LOL!!! Nicole, The quilt is beautiful! All your boys will have a nice keepsake when they're older. 10 days to go!!! What a beautiful quilt for your little one. 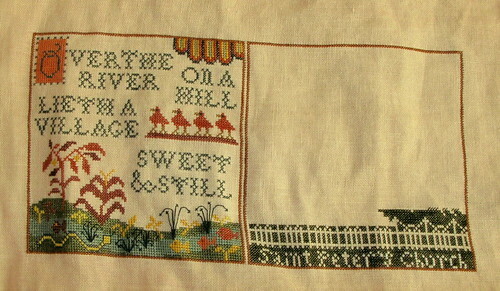 I love the prairie point border too! You are moving right along on VOHRH and it looks great! 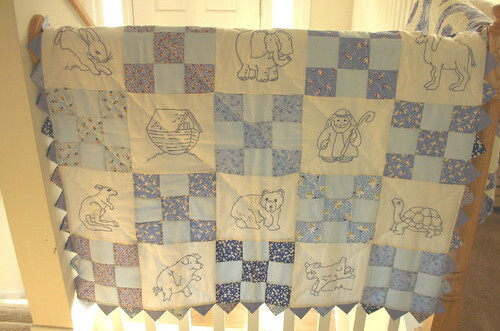 What a beautiful quilt that your grandmother made for your little one - something to treasure. Nice progress on the Village too! How beautiful! Your Grandmother is a talented woman. Awww it is soooo pretty.